Overall, the Vyng has a very nice interface and work fine to what it is meant for. There were no glitches and it performed smoothly too. When we were in the era of black and white phones like Nokia 3350, we used to set different songs or melody ringtones on our mobile phones. But with the changing time, we have got smartphones in our hands, extremely powerful, user-friendly and a package of entertainment, nevertheless, don’t you think somewhere we missed that joy and happiness we were getting from old phones just by simply listening to the ringtones. Don’t know about others but I really missed that. In this world of smartness, we are missing the Bijou artless things of our lives. So, why not bring those old days back to become happy using the different ringtones on smartphones. Wait, I am not talking about simple incoming ringtones, something that suits today’s generation i.e Video call ringtones. Despite having a smartphone, most of the people either use the default ringtone or some MP3 song which is generally monotonous. 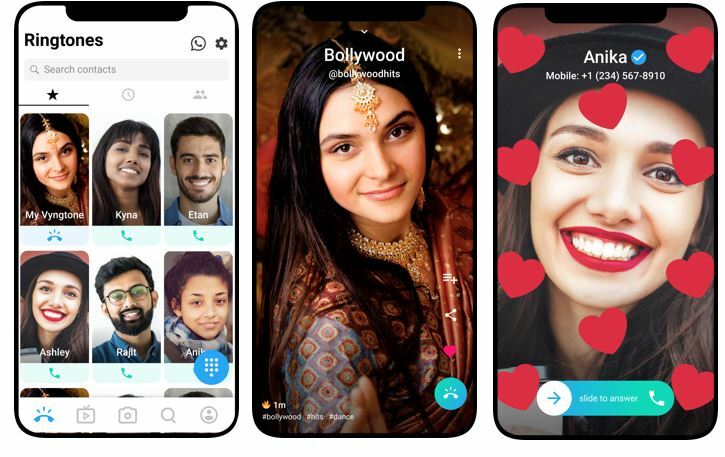 But now its time to move on one step further and create your own video call ringtone to for a person whom you don’t want to forget. Although Google play store is full of apps those allow to make ringtone from video on Android, one which I am up to nowadays is Vyng video ringtone app. It is a California based video ringtone application and already present in 174 countries including India, USA, Indonesia and more. After using Vyng for some time, here is my experience and thoughts about on this free video ringtone maker. 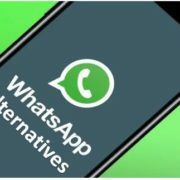 Music videos, funny videos, WhatsApp status videos, song videos, trending videos for downloading, sharing, and setting for friends. Browse hot viral videos uploaded from the community in the app to find, share, and set on your phone. Instead of a normal audio-only ringtone, choose from Vyng’s massive video library or upload one of your own videos to play when you receive a call. One can set custom vyng ringtones for each of your friends and family members so that a specific video will play when they call you. Make Your Own Vyng ringtones: One can create your own custom videos in-app as well as import your videos from other apps including TikTok, Snapchat, and Instagram so that Vyng users can discover and can set them as a ringtone. 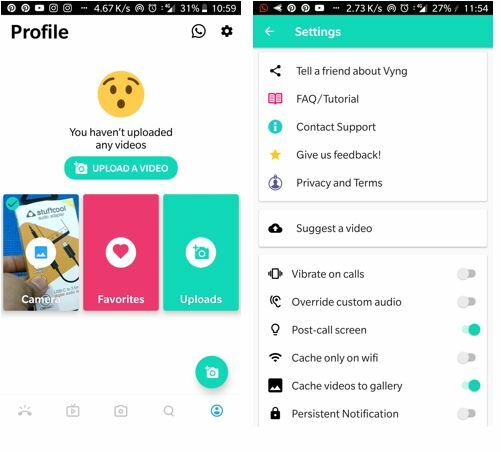 Vyng lets you share videos from the app and set them as your status in WhatsApp, Instagram, and Facebook. Vyng app is available only for Android user, currently. 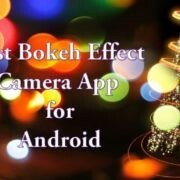 To download this free video ringtone app, here is the link Android. After installing open the app. Toggle the buttons for the Default phone app and General Permissions options when appears. 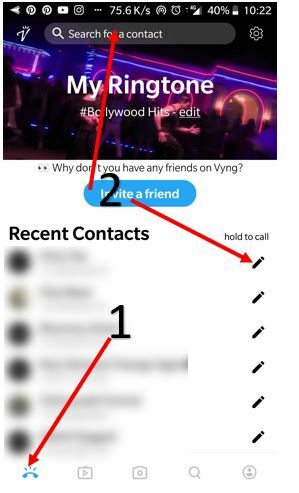 It allows Vyng to play the video ringtones for calls. Now all you set to explore this app. Open the app, tap on the telephone icon. And the either search for the contact or select the one from the recent contact list by tapping on the Pencil icon. After the above step tap, you have three ways to set video ringtone for that particular contact you have selected. One is browsing through the database of the Vyng, second is upload from your phone’s gallery and the last one record right away from your camera and create ringtone by yourself, instantly. Here we are selecting the Browse Videos option to set incoming call video from Vyng video library. 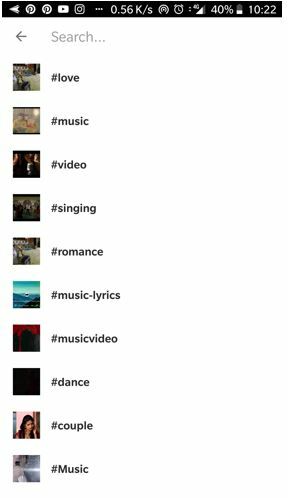 Now you will see the list of different genre of songs tagged with hashtags such as love, music, video, romance, sad video ringtone and more. Select the one to explore further; we are using the #love. Under the selected hashtag you will see lots of different channels and videos created by the community of Vyng. 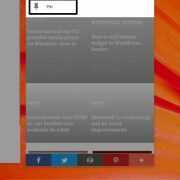 Explore the variety of English and Hindi ringtones (videos) and when you find the one that you would like to set for some phone call just tap on the telephone icon given on the right side. Simple isn’t. Beside just uploading or downloading the video ringtones, this app can be your TikTok like apps alternative. It not only lets you create the videos but also a way to show your talent to the world in the form of videos. 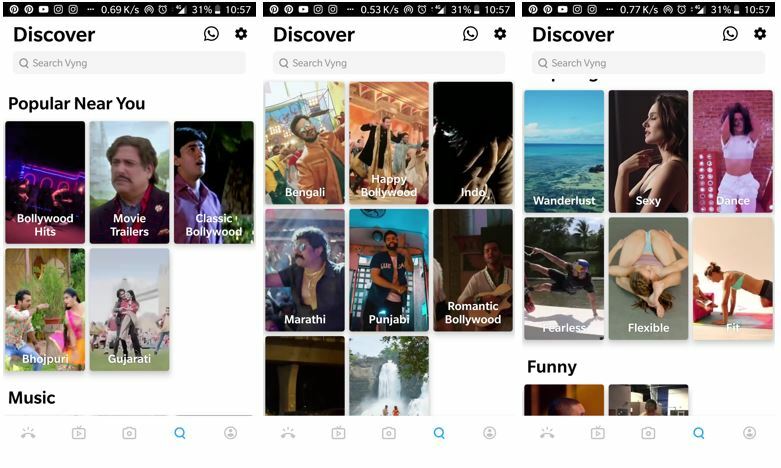 So, in context of this, when you tap on the TV like icon given on the bottom of the app you will find all the Trending videos created by different users of Vyng; including info about how many people have watched it so far and the numbers like plus shares that video has got. 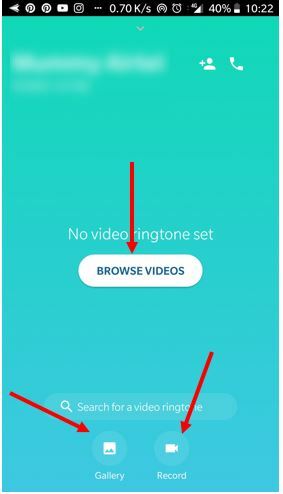 While surfing through a disparate pool of trending videos, if you like any of them, can directly set that as video ringtone by using the Call icon given on the right side. 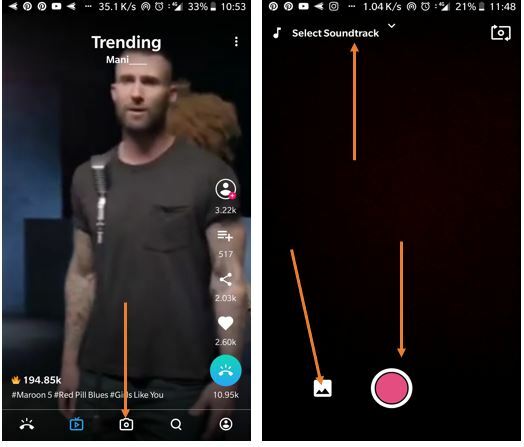 To record the video on their own, the users of Vyng can tap on the camera icon given at the centre of the bottom. 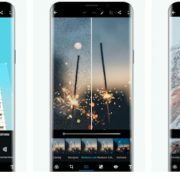 Both the front and rear camera can be accessed on the app and from the same place, one can upload the videos from the gallery. If the user wants to add a custom sound to videos, he/she can use the Soundtrack option. However, the options for custom sound are very less. At the last, the Profile tab is situated. The users uploaded videos and app’s setting option can be accessed from here. The app interface is quite easy to use and clutter free. Process of uploading videos rather smooth. Video trimming option is also available. 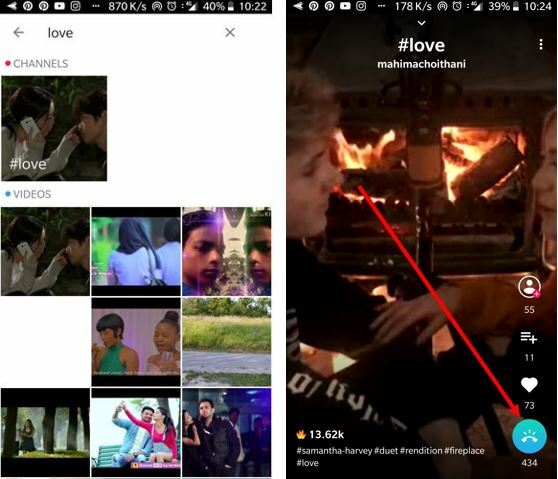 Sharing of the videos both to social media is super easy with just one tap. Default ringtone will ring if the applied video for some contact doesn’t possess audio. Not actually cons, I would rather like to say suggestions or improvement areas. While uploading videos, the user should get some filter or effects options. The soundtrack option for custom upload should have some more tracks. Sometimes it missed the call, that needs to be improved. 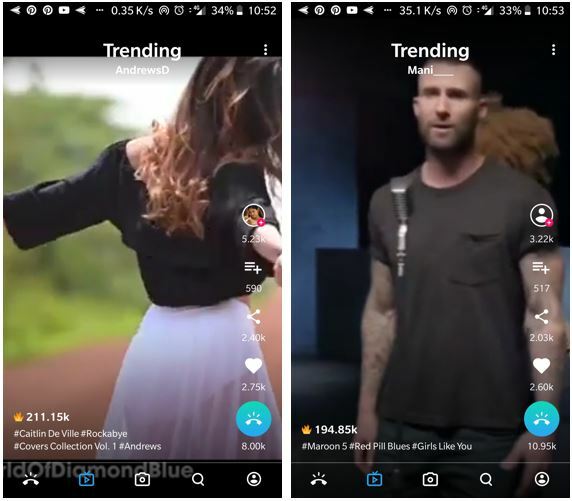 Although we can’t compare it with apps such as Like and TikTok because it is meant to provide a video ringtone facility to a user. Nevertheless, one can also show his talent on Vyng while others can kill their boring time by watching them. So, it was a short review on Vyng video ringtone app, If you are its user, please let us know your view about it. The comment section is all yours! !